420 pages | 156 B/W Illus. 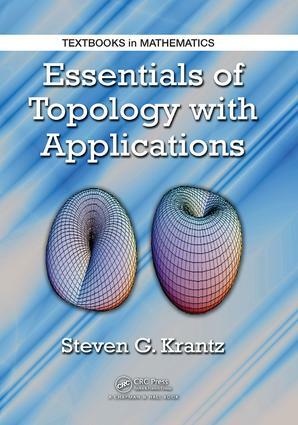 Supported by many examples in mathematics, physics, economics, engineering, and other disciplines, Essentials of Topology with Applications provides a clear, insightful, and thorough introduction to the basics of modern topology. It presents the traditional concepts of topological space, open and closed sets, separation axioms, and more, along with applications of the ideas in Morse, manifold, homotopy, and homology theories. After discussing the key ideas of topology, the author examines the more advanced topics of algebraic topology and manifold theory. He also explores meaningful applications in a number of areas, including the traveling salesman problem, digital imaging, mathematical economics, and dynamical systems. The appendices offer background material on logic, set theory, the properties of real numbers, the axiom of choice, and basic algebraic structures. Taking a fresh and accessible approach to a venerable subject, this text provides excellent representations of topological ideas. It forms the foundation for further mathematical study in real analysis, abstract algebra, and beyond.